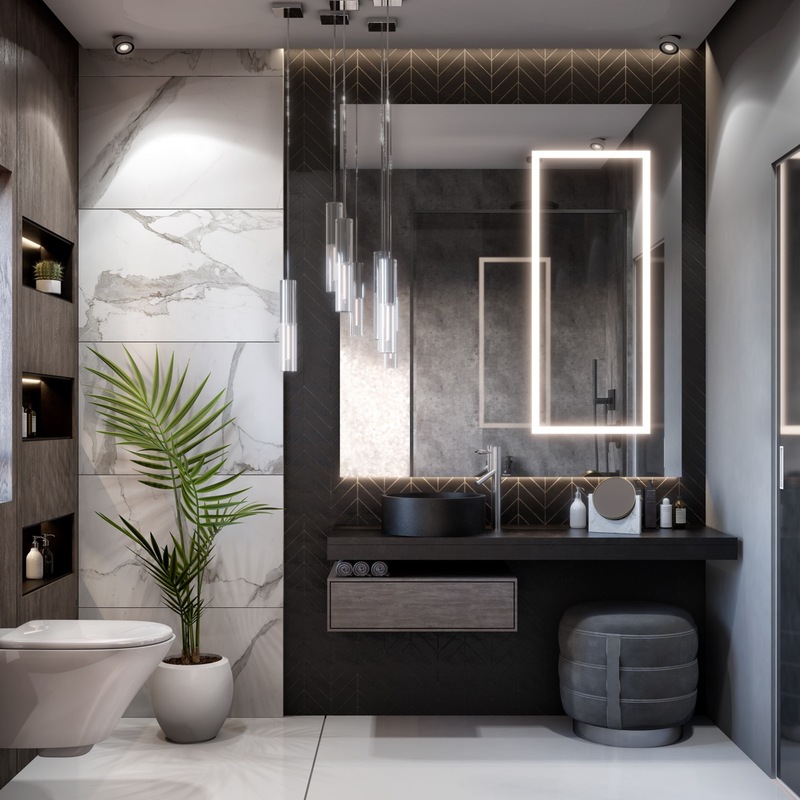 We all spend a lot of time in our bathrooms, so it’s only right that we should make them into a simply gorgeous place to be. 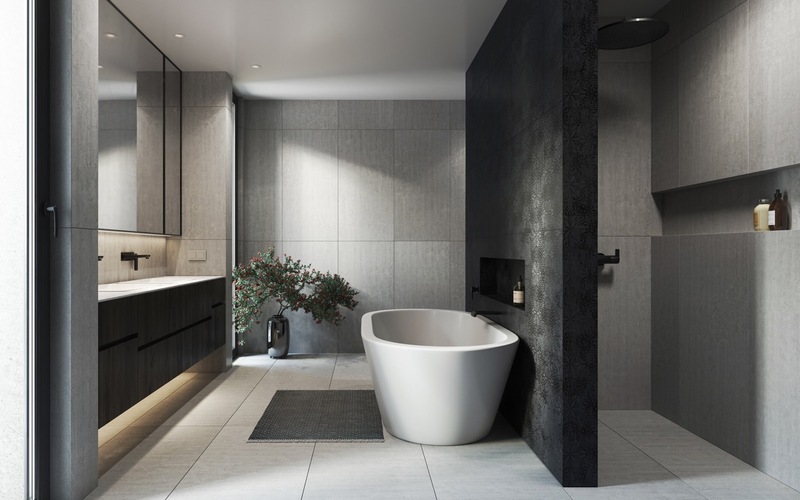 Unique bathtubs, sleek vanity units and modern toilet designs come in all shapes and sizes, to suit spaces and budgets both large and small. 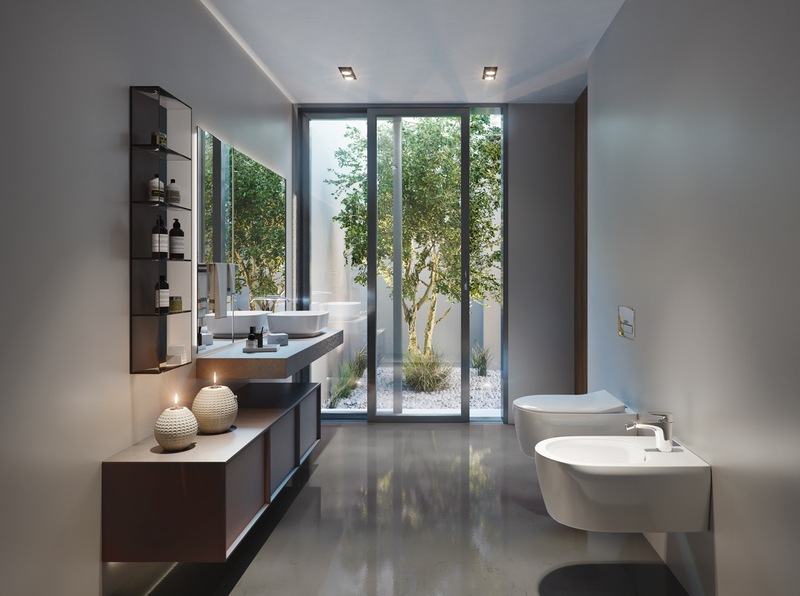 Aside from the essential facilities, bathrooms can be accessorised with chic dispensers and storage. 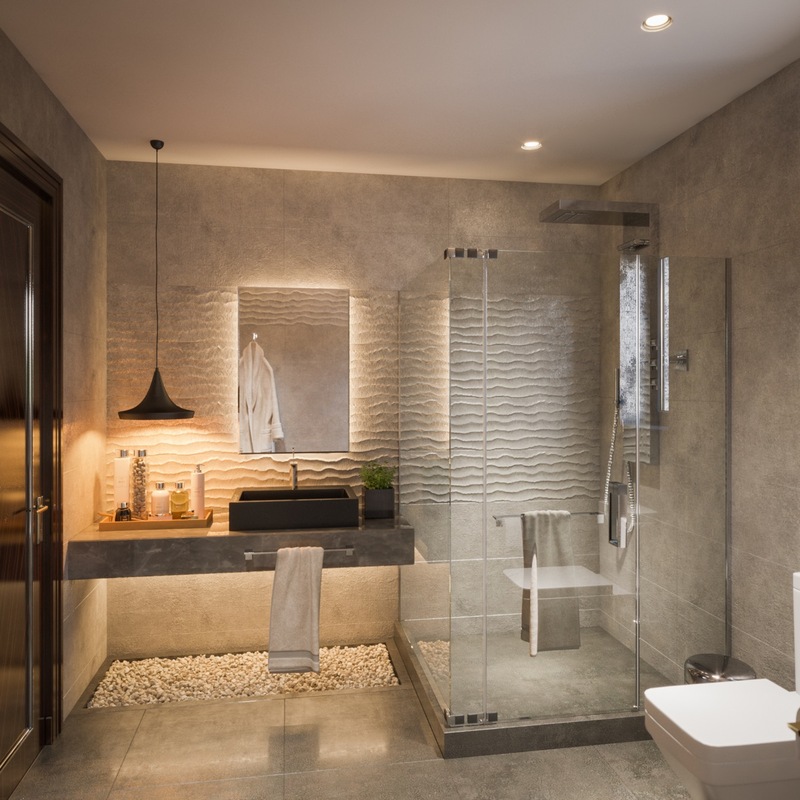 Lighting is an integral piece of the puzzle when designing a bathroom retreat too, as light can entirely change the mood of a space. 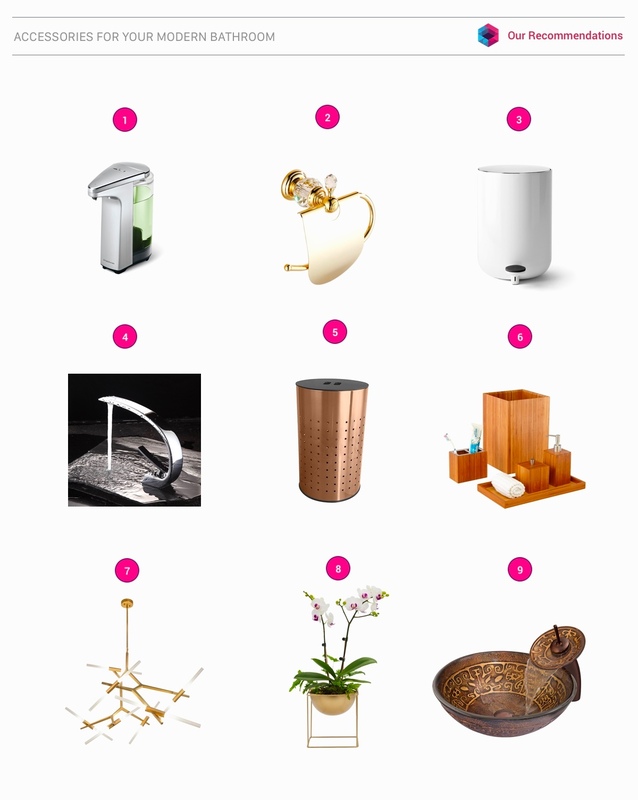 To help inspire your next remodel, we’ve put together a collection of 51 modern bathroom ideas that feature stunning sanitaryware, furniture, faucets, bathroom accessories and atmospheric lighting schemes. Spend a night on the tiles. 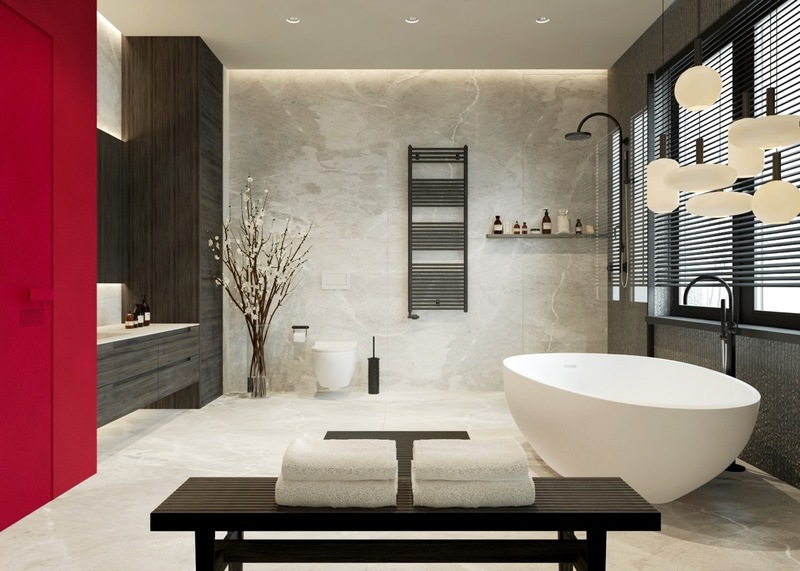 If you love to linger in the tub at the end of your day then make it the focal point of the room. 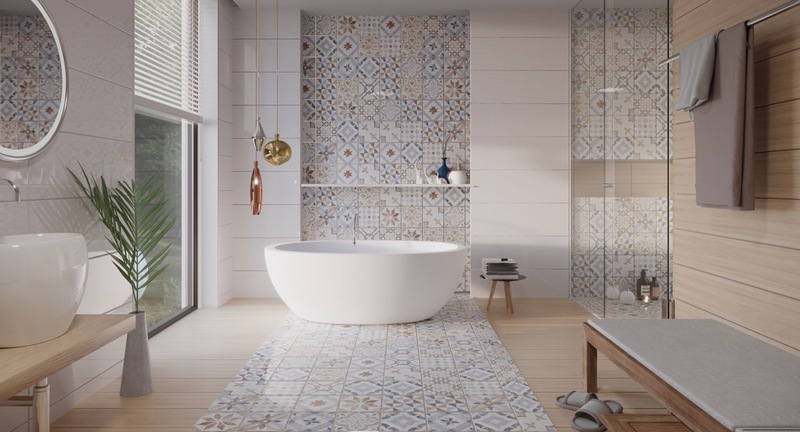 Make a pretty path to your bubble bath out of some terrific tiles, like these colourful patterned ones. Continue the tile path up the wall behind the tub too, to give it a real sense of grandeur. 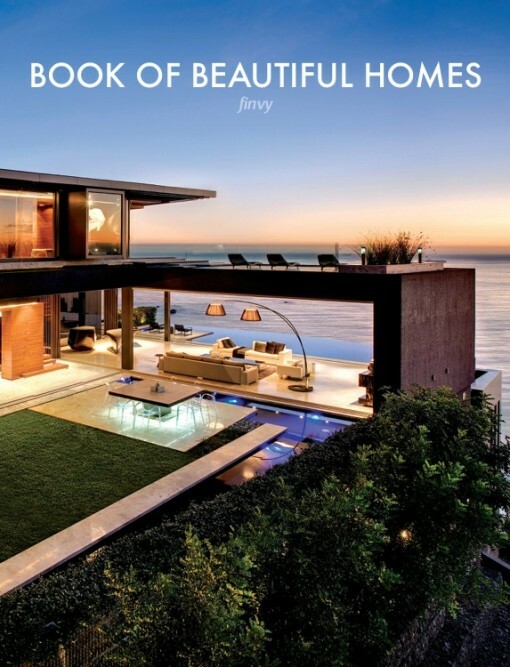 Bathe on a bed of pebbles. 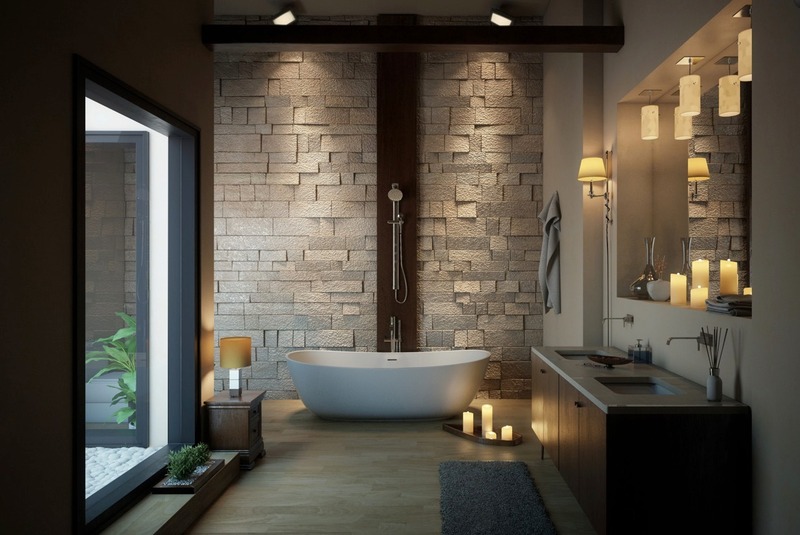 Many modern luxury bathrooms have adopted this idea of placing the bathtub atop a bed of pebbles. 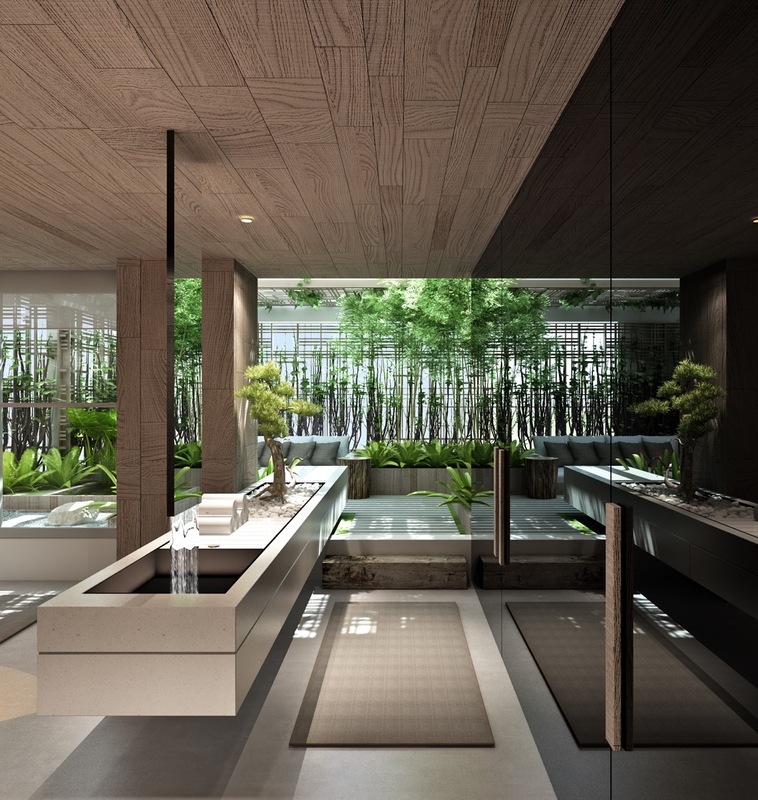 The natural stone works well with a botanical theme and wooden elements. 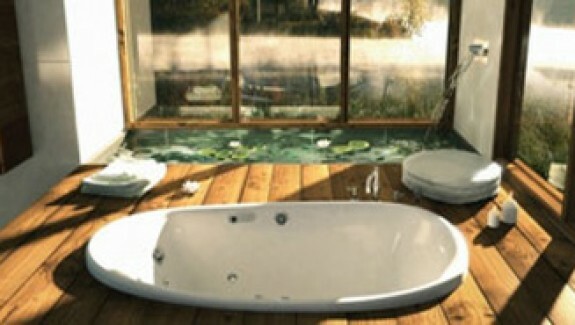 Don’t have a bathtub to put on the pebbles? No worries, a patch of pebbles under the vanity works well too. 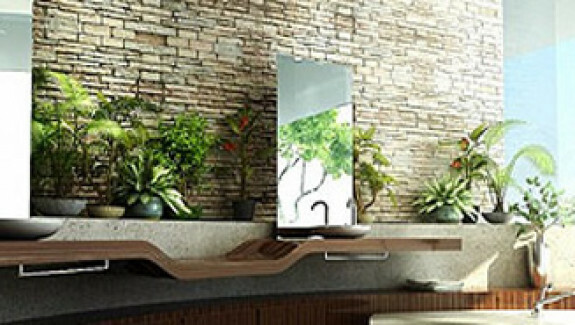 Placing a bathroom basin at window doesn’t mean you have to miss out on a vanity mirror. Mirrors can also be ceiling mounted, or suspended on a horizontal bar across the window pane. Don’t cling to the borders. 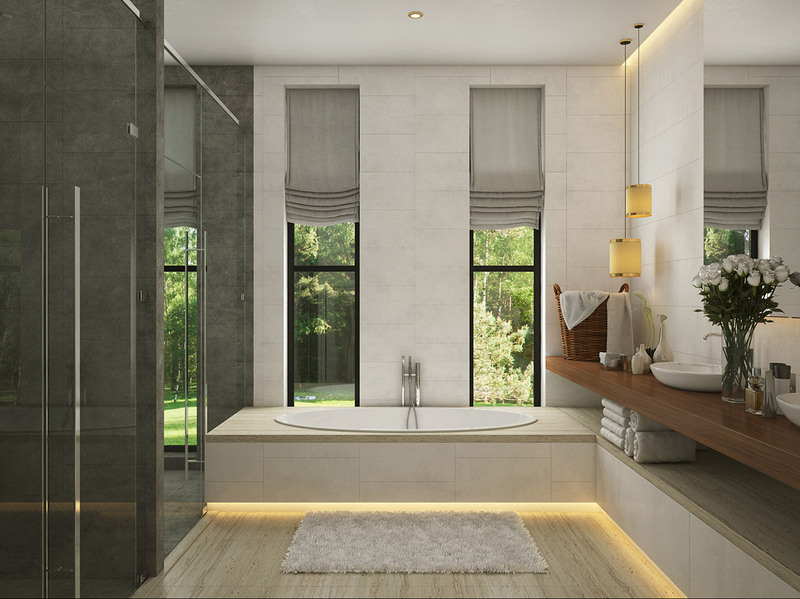 Typical bathroom layouts place all of the facilities neatly against the walls of the room – but what if you created an extra internal wall? 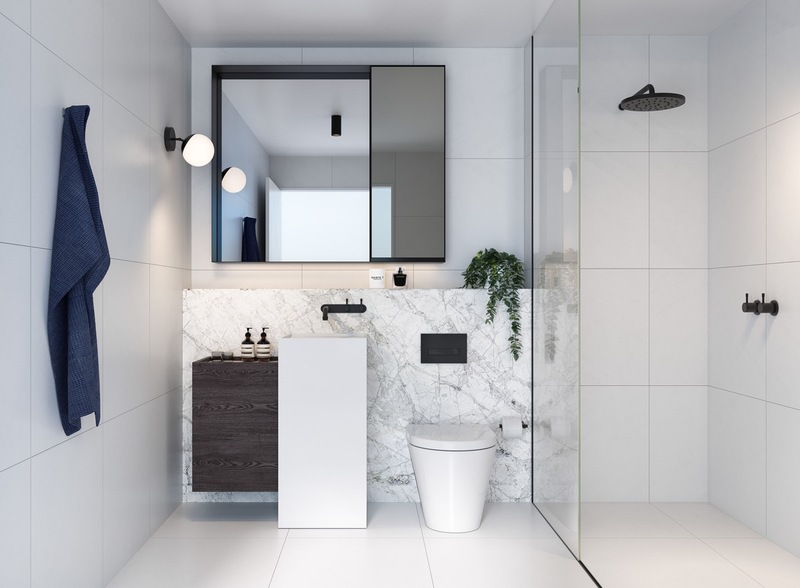 By building up a solid dividing wall across the shower, and placing the bathtub against the other side of it, entirely new zoning is achieved. It’s all about the atmospheric glow. 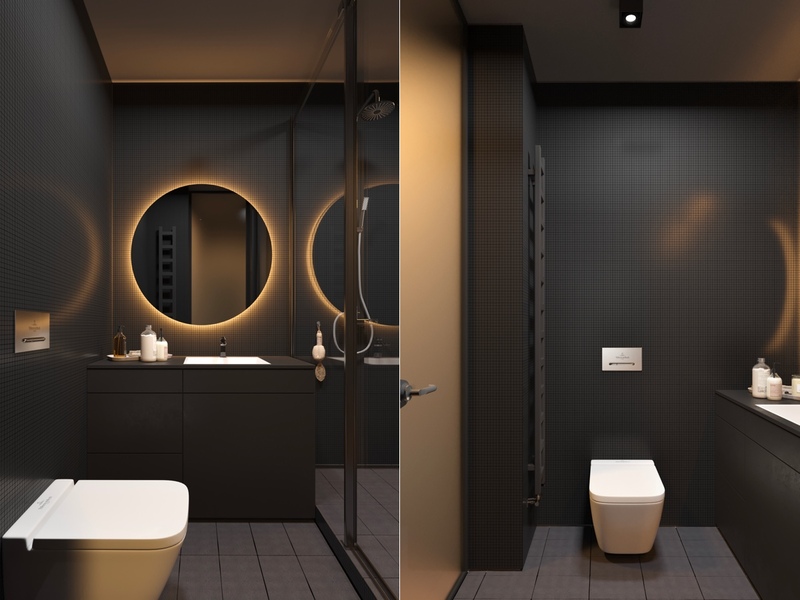 Even the simplest, coldest looking bathroom schemes can be given a special cosy glow by installing perimeter lighting. Be sure to fully recess LED strips for a clean and subtle effect. 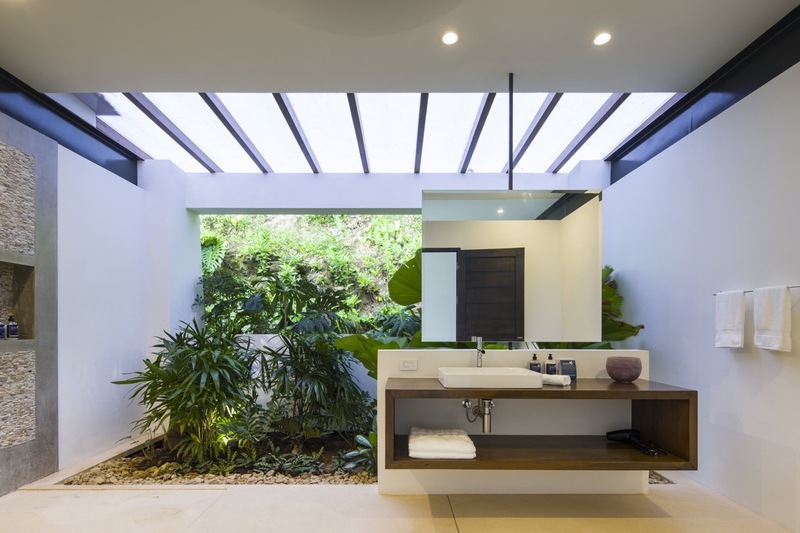 Create a terrace bathroom to enjoy the beauty of the outdoors. If you want to incorporate botanicals into your scheme then how about a planter that’s integrated right into the vanity unit countertop? 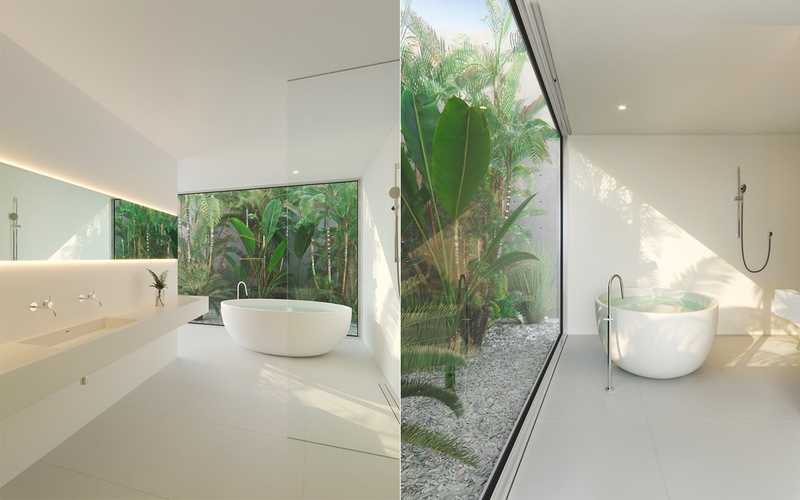 Plant a bathroom courtyard. Walling off a little courtyard area outside floor to ceiling windows gives you a garden view without worrying about privacy. 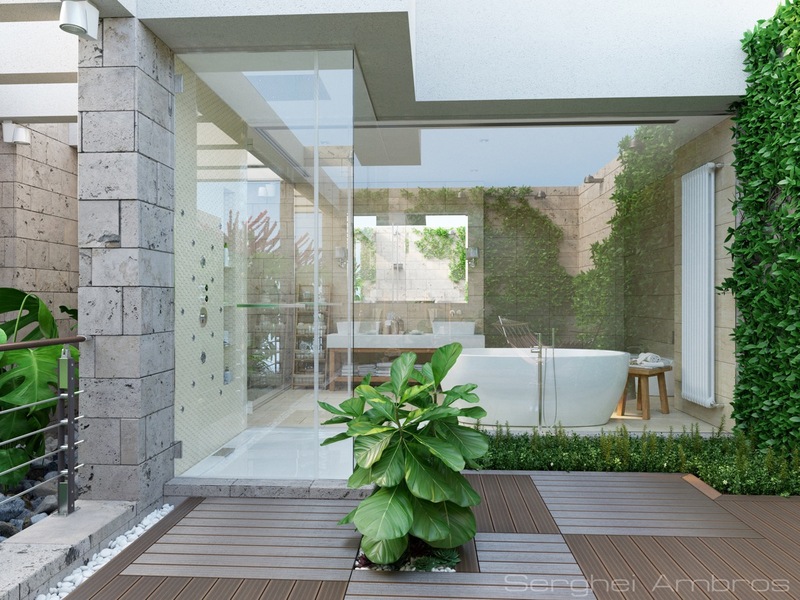 Sliding doors opening onto a courtyard not only makes you feel closer to nature but also provides great bathroom ventilation. 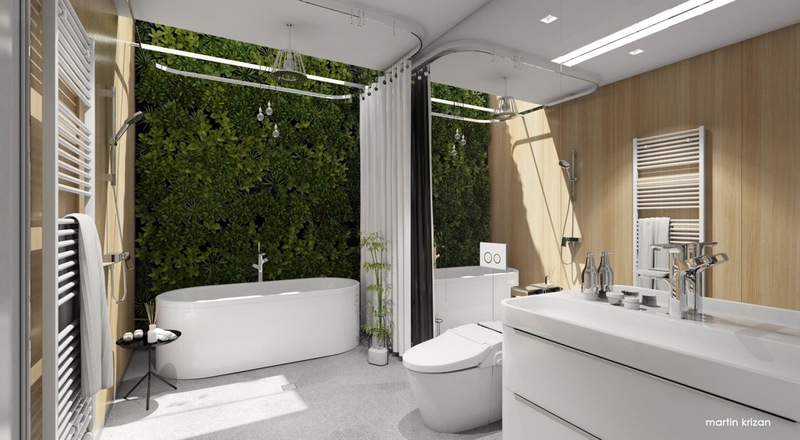 You can plant a small garden right inside your bathroom too. 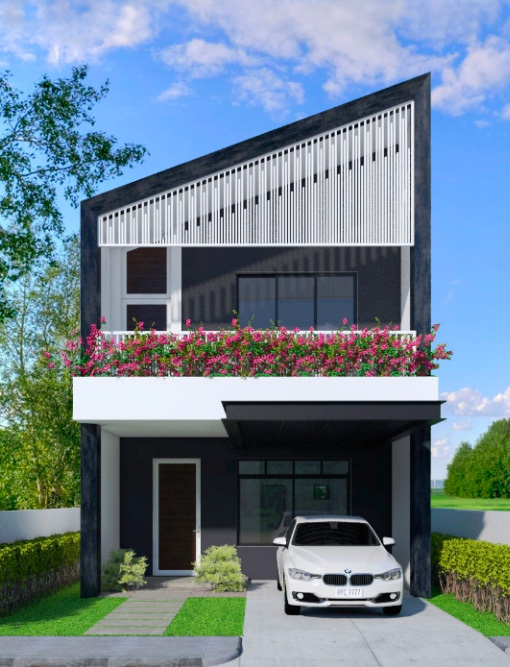 Vertical gardens are a great option for those who aren’t blessed with a garden view, nor have space for an internal courtyard. Create a focal point with wall planters. These circular wall mounted planters pattern a plain white section of the room. 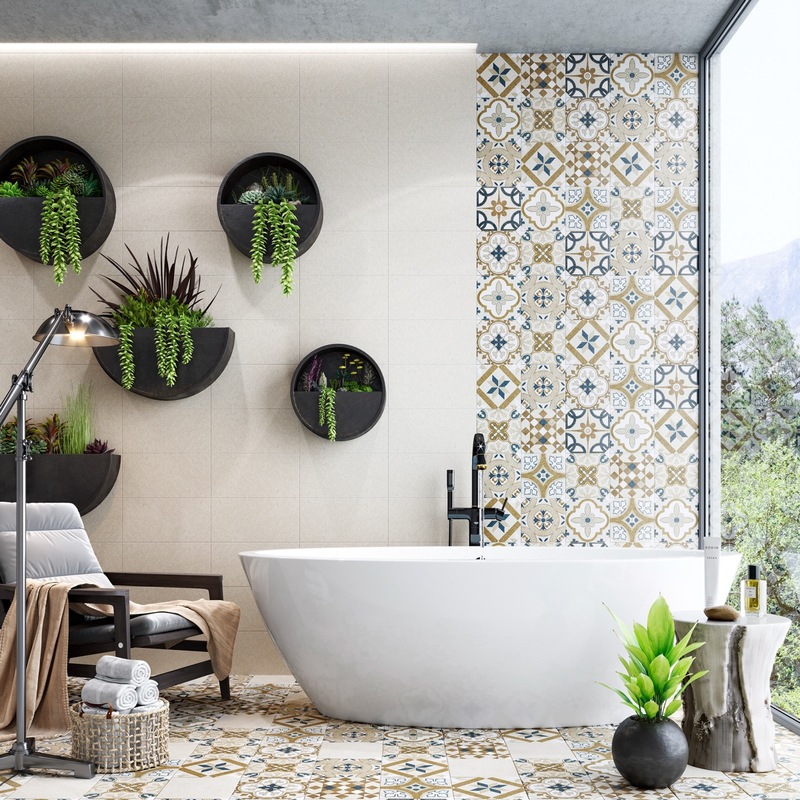 The living greenery brings a freshness to the decor scheme, and balances out a colourful border of tiles. Don’t be shy with colour. 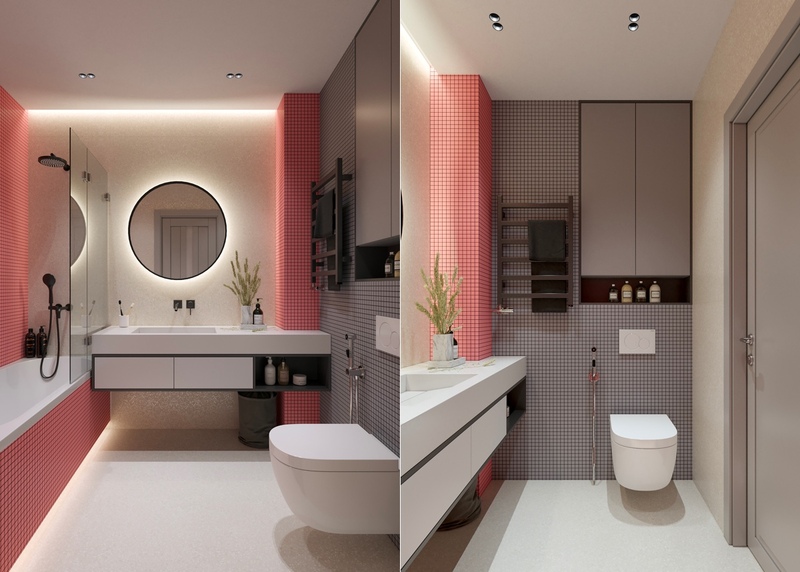 Bathrooms do not have to be the most colourless room in the house! Check out this pink and green decor for inspiration. 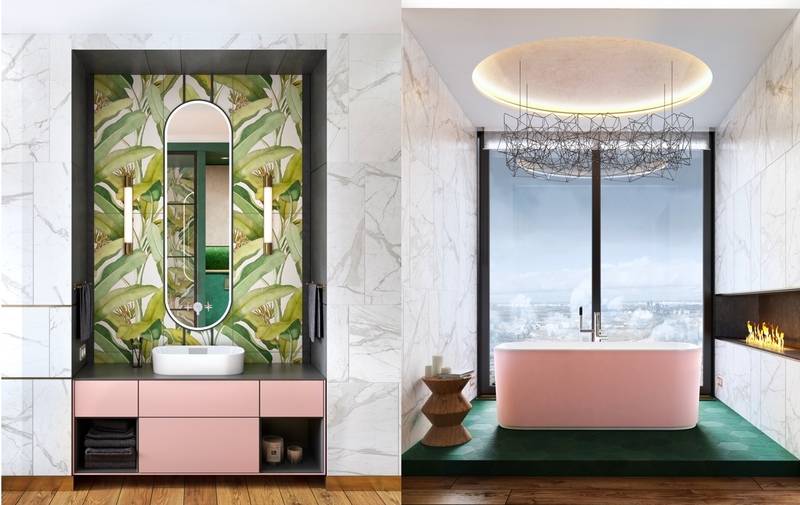 A pink vanity sings off a green leafy print backdrop, whilst the pink bath stands on a green tile floor. The modern open fireplace is worth a special mention too – imagine the hours soaking in that tub watching the dancing flames. Another pink offering – this time looking pristine in pastel pink and pale grey. 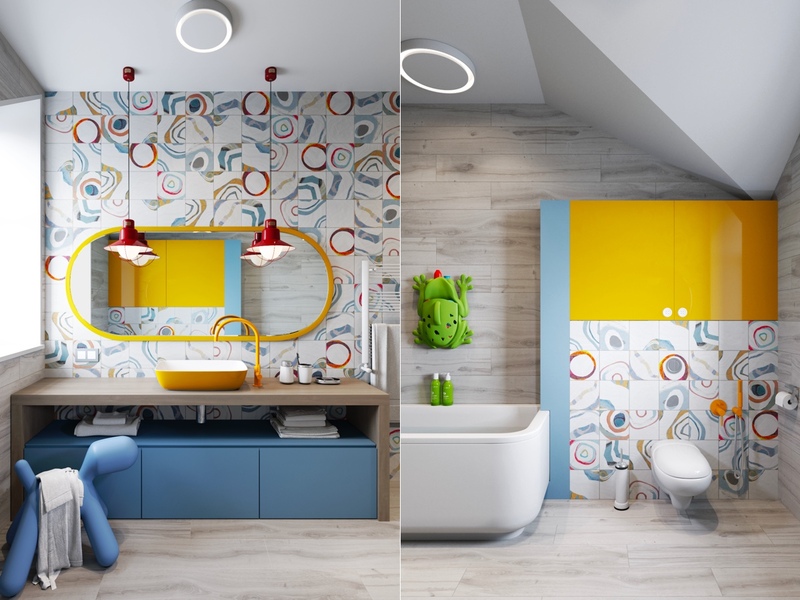 You can colour with light too – in fact, colour-changing LEDs offer you the opportunity of changing your colour scheme on a whim, and at the single touch of a button. 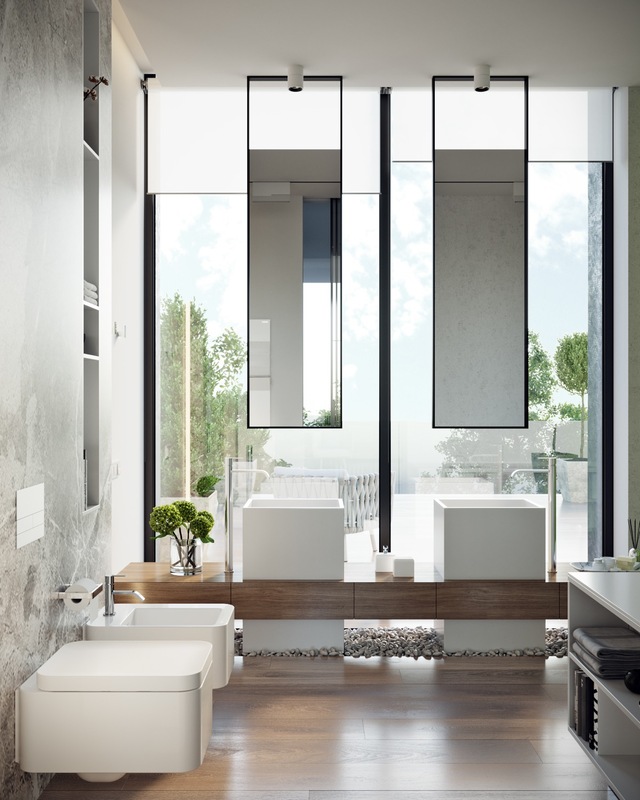 Break down the boundaries with an open plan ensuite bathroom. 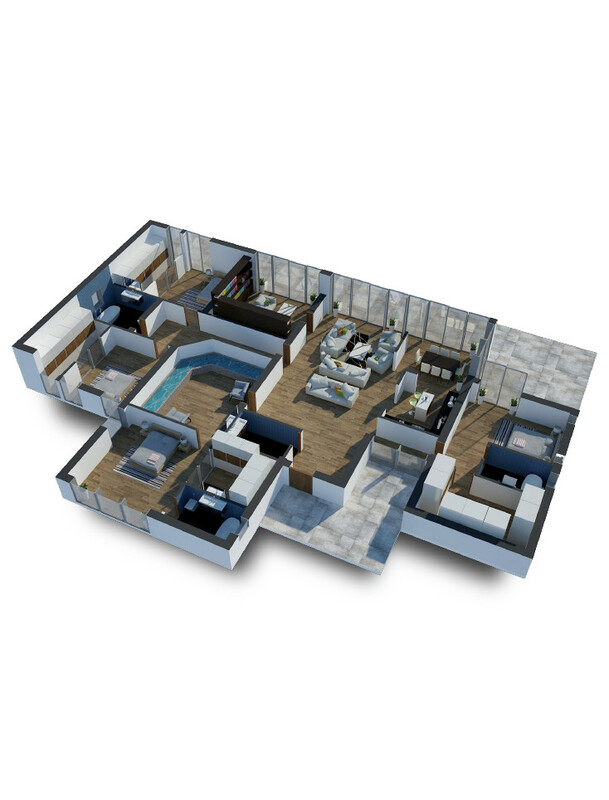 Many modern master bedroom designs now feature bathroom facilities with no dividing wall. 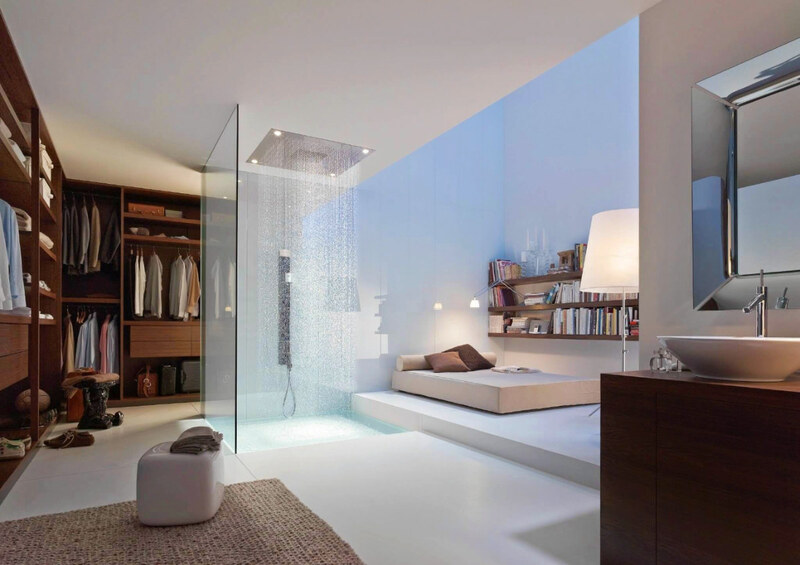 It’s also en vogue to link the ensuite with a deluxe walk-in closet/dressing room. 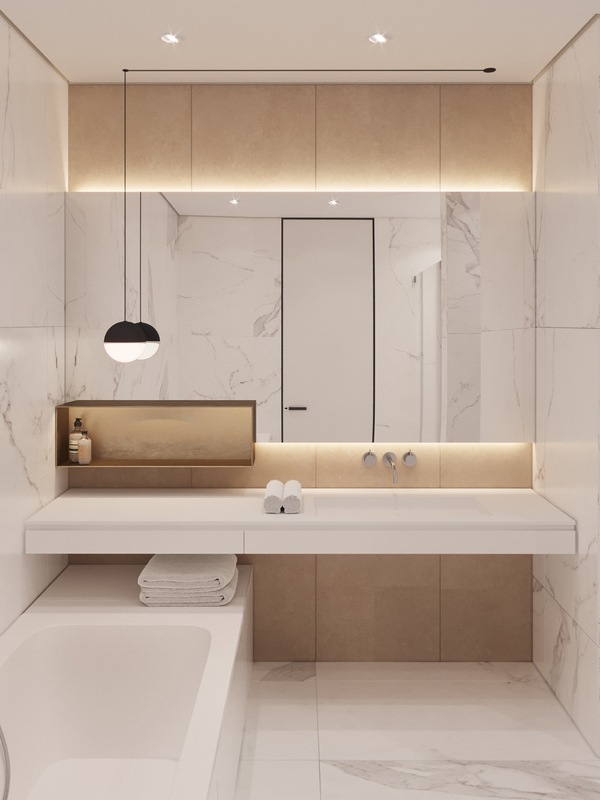 Cut up the space with sections of contrasting tile colour. The contrast tricks the eye into seeing a bigger space. 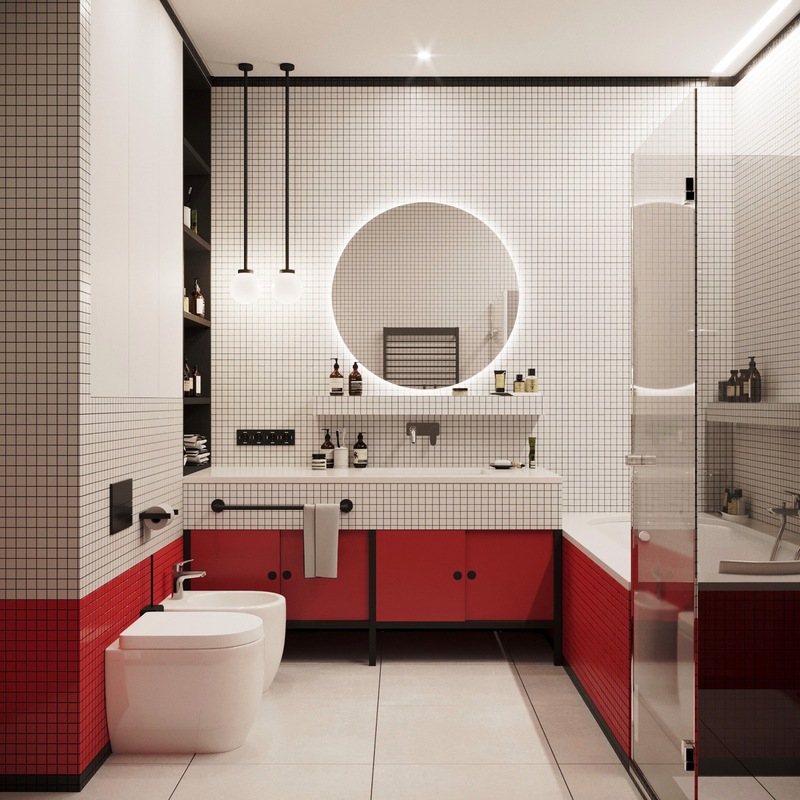 Apply a border of colour to unite the elements of the room as one, like these red tiles and matching cabinets. Sanitaryware isn’t always white. Get a load of these amazing primary yellow facilities! 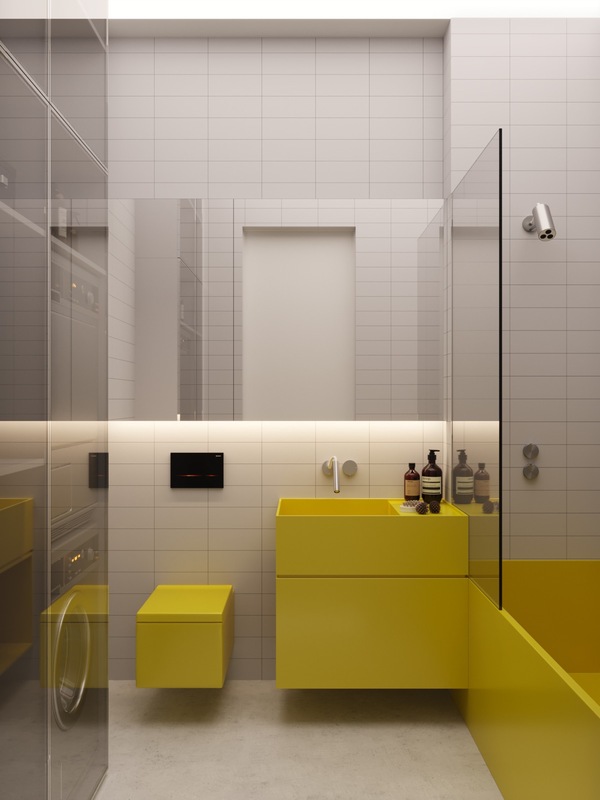 Their hard edged linear design gives the bathroom a cool Mondrian style. …Pushing the black theme a lot further gives a strong and solid look. 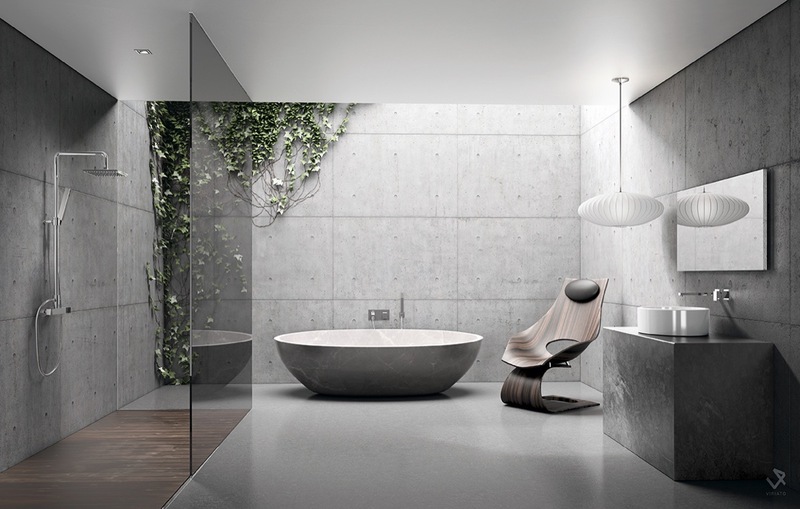 Use concrete to add industrial edge to your modern bathroom design. 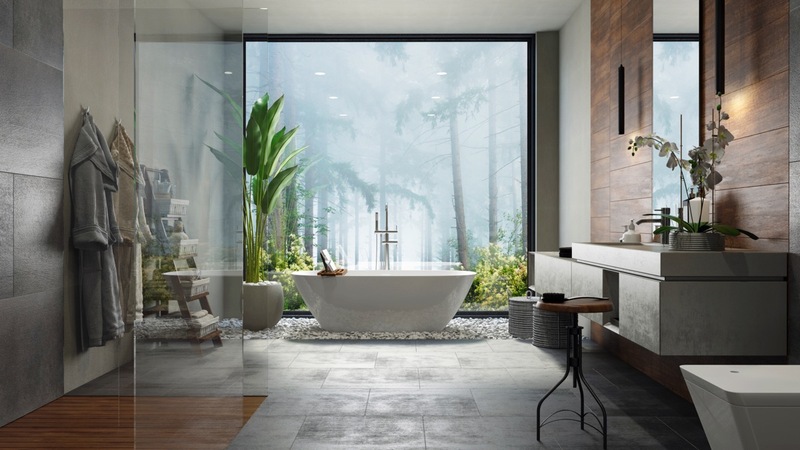 A concrete bathroom may sound like a harsh look, but introducing curvaceous furniture, warming wood tone and indoor plants will soften the look. Textured feature walls transform an average space. 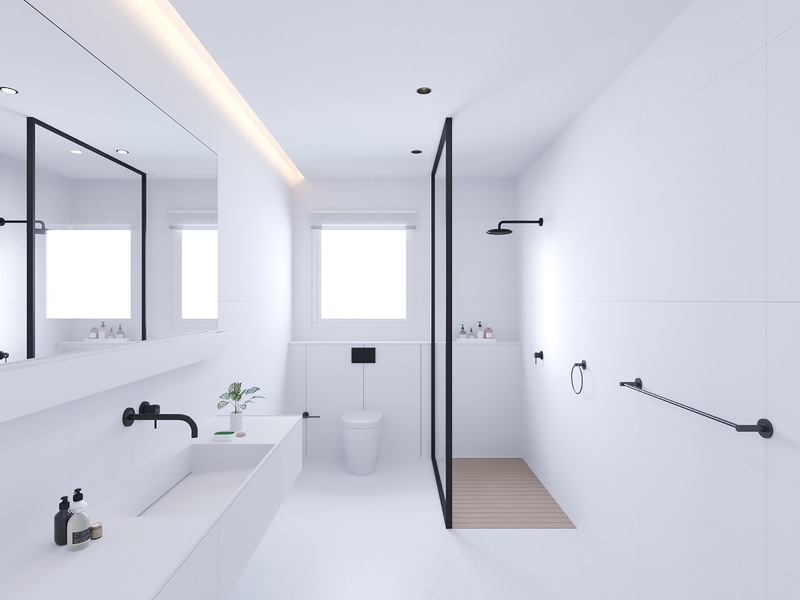 This same bathroom scheme without the extruding stone wall would still look nice for sure, but it would have nowhere near the same wow factor. Be sure to add focussed lighting to really accentuate the installation. 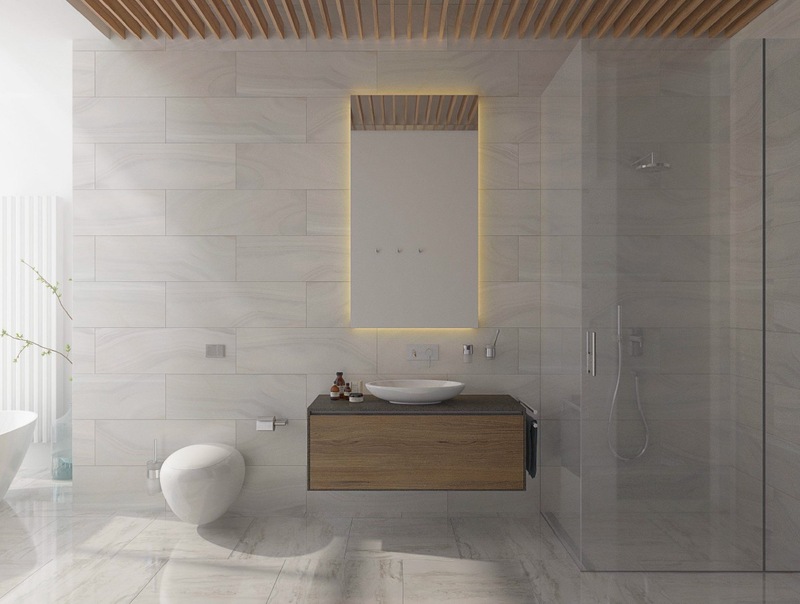 Another stunning feature wall – this time accompanied by a live edge vanity shelf to create a breathtaking modern rustic bathroom. 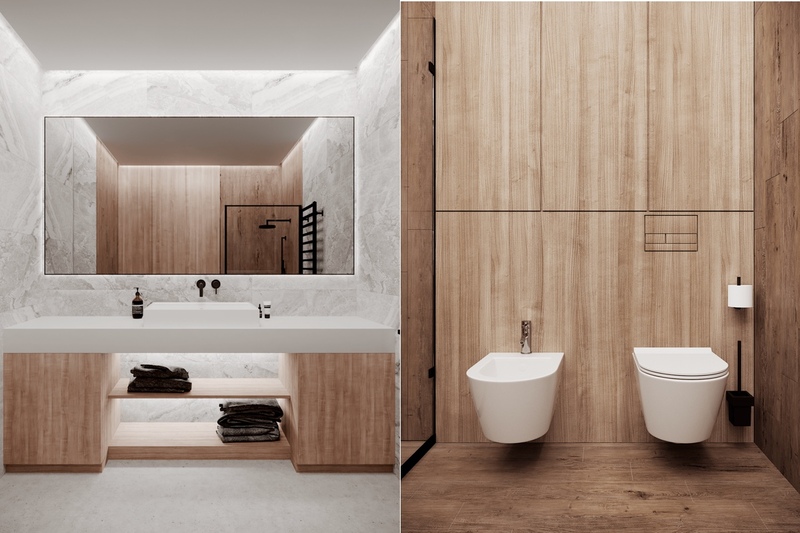 Play with scale and shape in your bathroom. 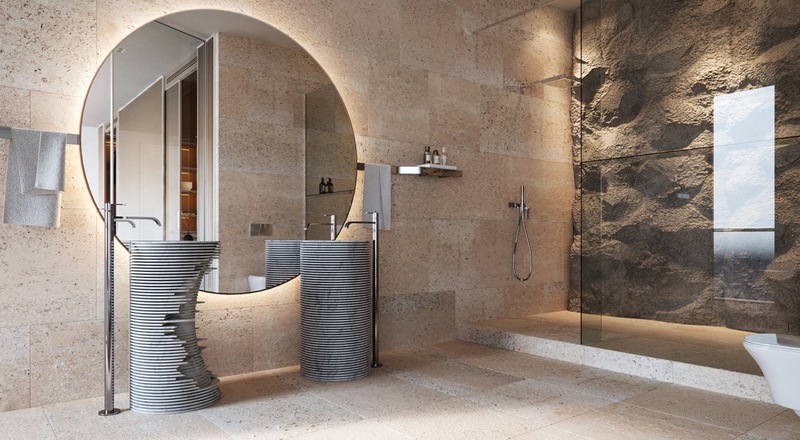 There are vanity mirrors, and then there’s THIS: One giant round mirror spans the width of two pedestal sinks; it also plays on their unique cylindrical design. 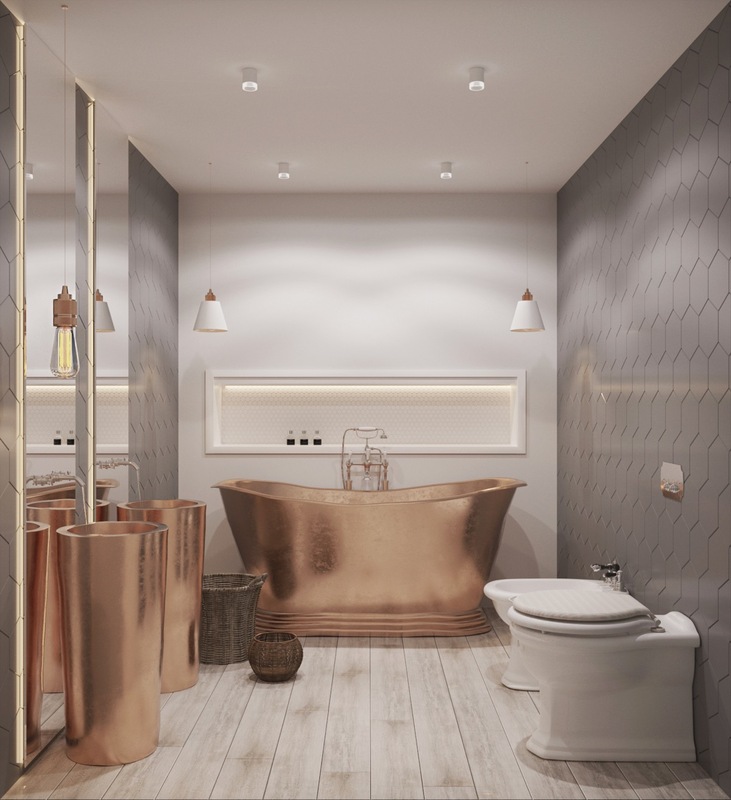 If copper is your cup of tea, then let it overspill into your bathroom. This traditional style roll top copper bath and modern copper pedestal sinks make a deluxe team. 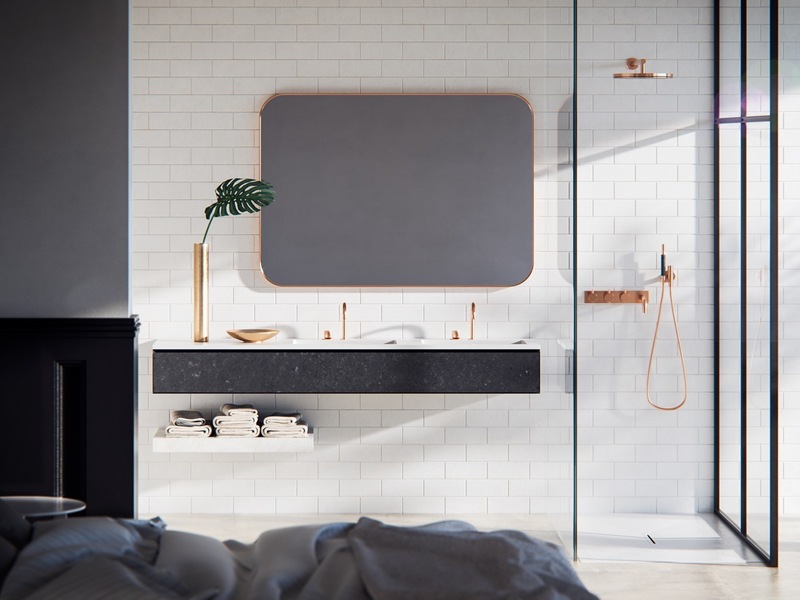 Smooth grey tiled walls counteract the heat of the shiny copper tone. 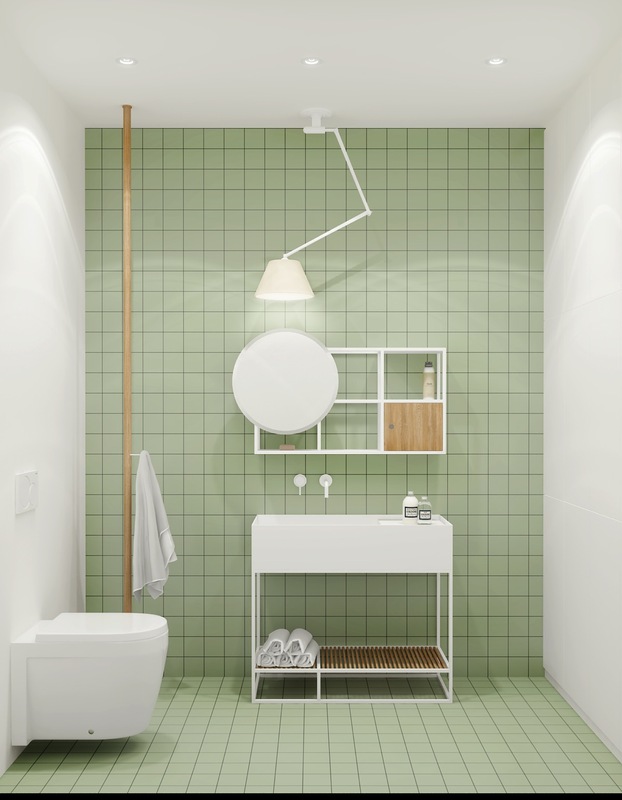 Add in colourful modern bathroom accessories, like this set of green lotion and soap dispensers, soap tray and wall mounted toilet brush. Dial up the drama with an all black paint job–or wall tiles–and a backlit vanity mirror. Be sure to keep all the cabinetry and towel heaters black too. 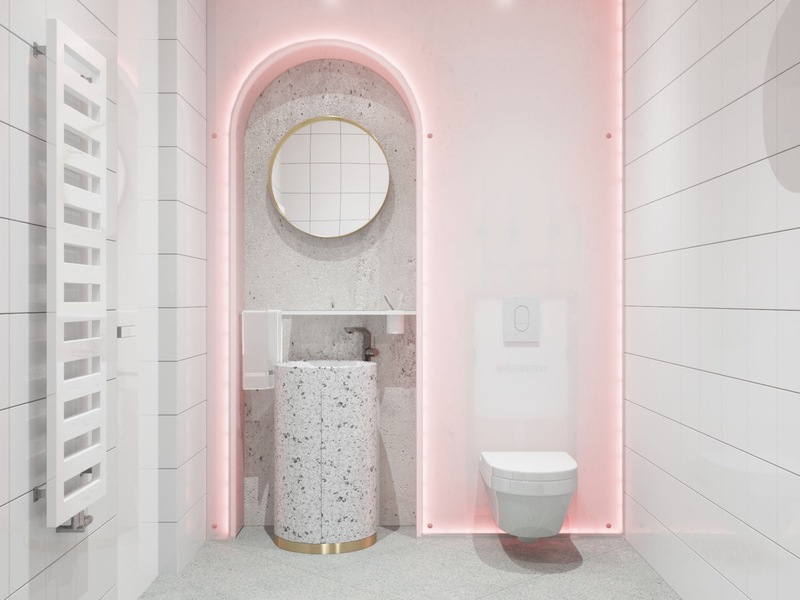 You might not think that toilet cistern boxing is the optimum place for a feature wall, but hey – if it works, it works. 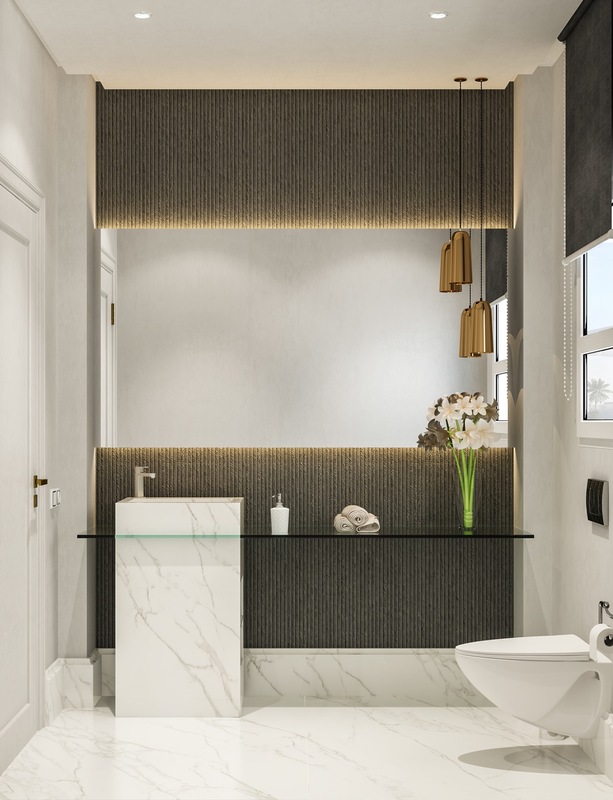 A slick vanity unit could be all that’s needed to give an existing tired bathroom design a modern pick-me-up. 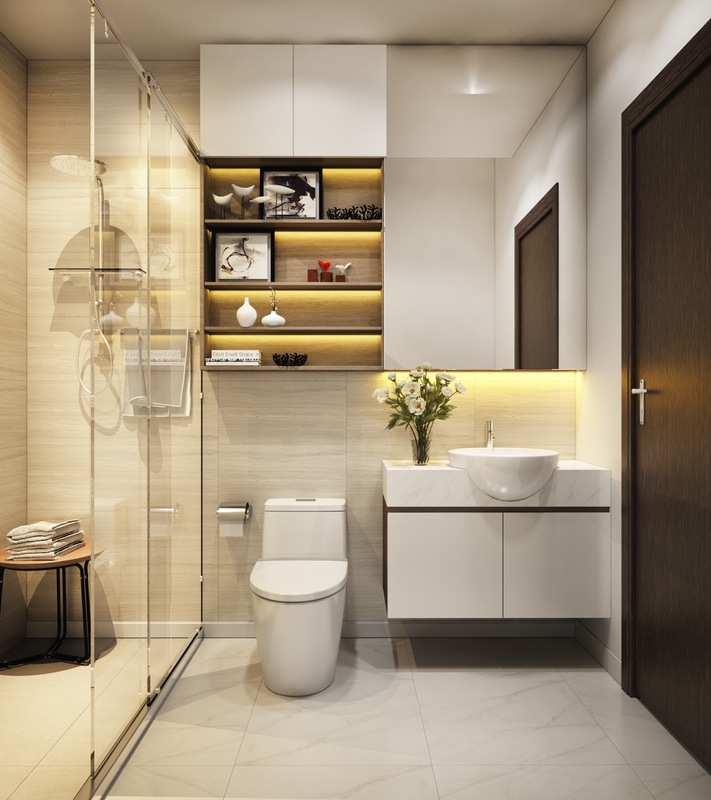 Consolidate your bathroom and utility needs in one combined space. Don’t get hung up on being too “matchy-matchy” with your bathroom sanitaryware. 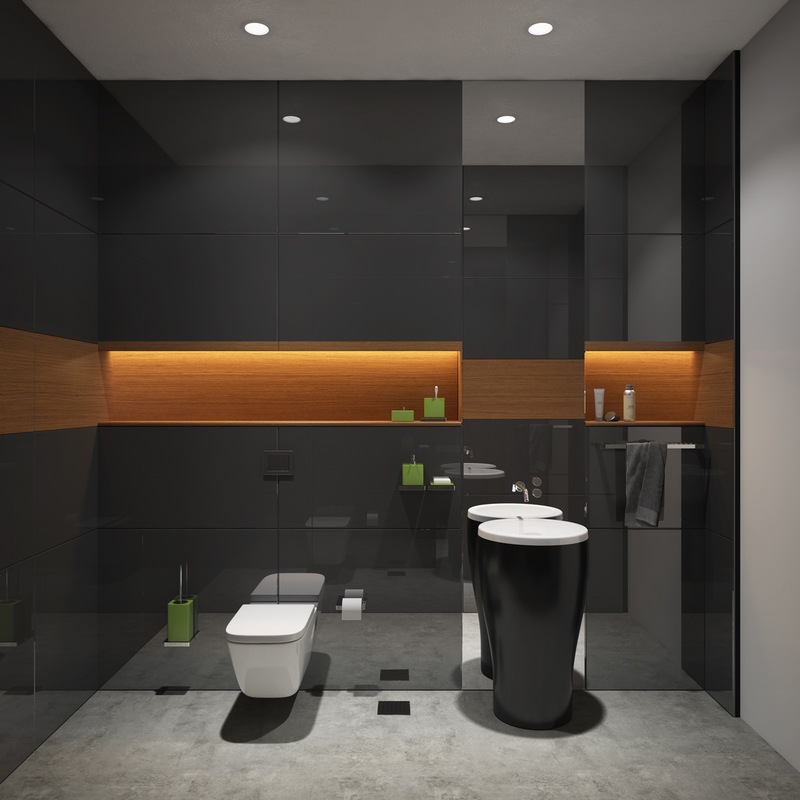 This black vessel basin looks divine on the dark vanity wall, whilst a white toilet works great on the adjacent wall. Dream up a special place. 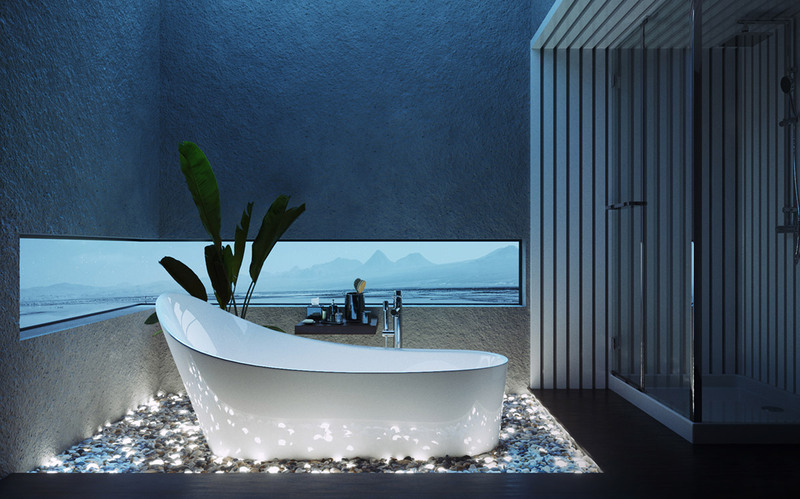 This modern slipper bath floats on a dreamy bed of twinkly lights. Kids bathrooms can be a challenge to get right. 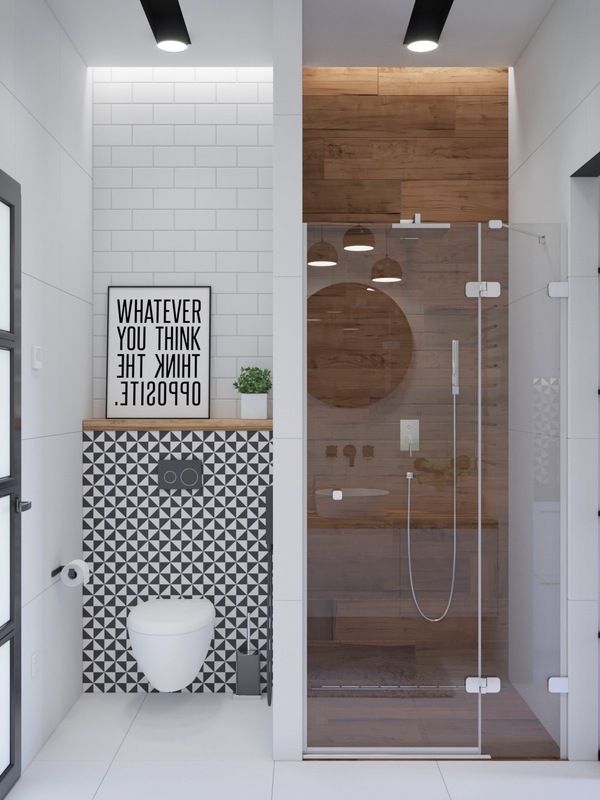 Traditional bathrooms are not the stuff that kids dreams are made of – in fact, it’s really hard to get them in there most of the time! Use bright colours and cute character accessories to get them running to take a bath and brush their teeth! Who could resist turning on a banana yellow faucett anyway? 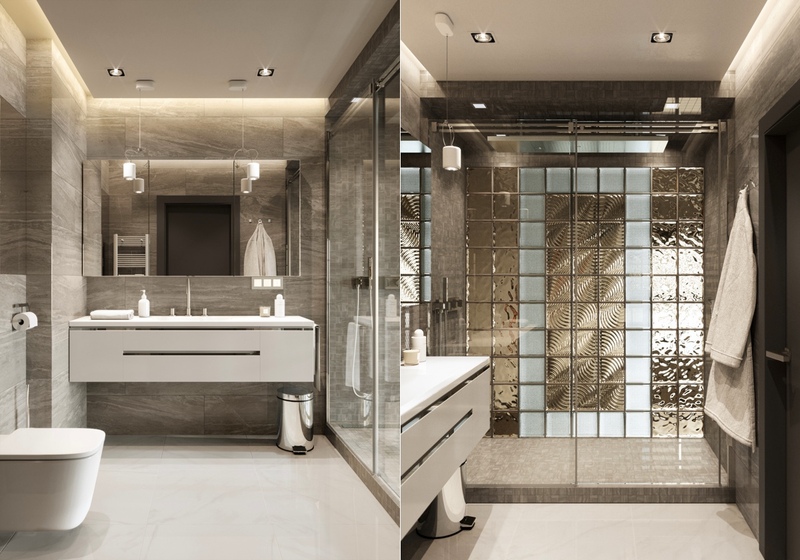 Metallics and mirrors create a luxe modern effect. 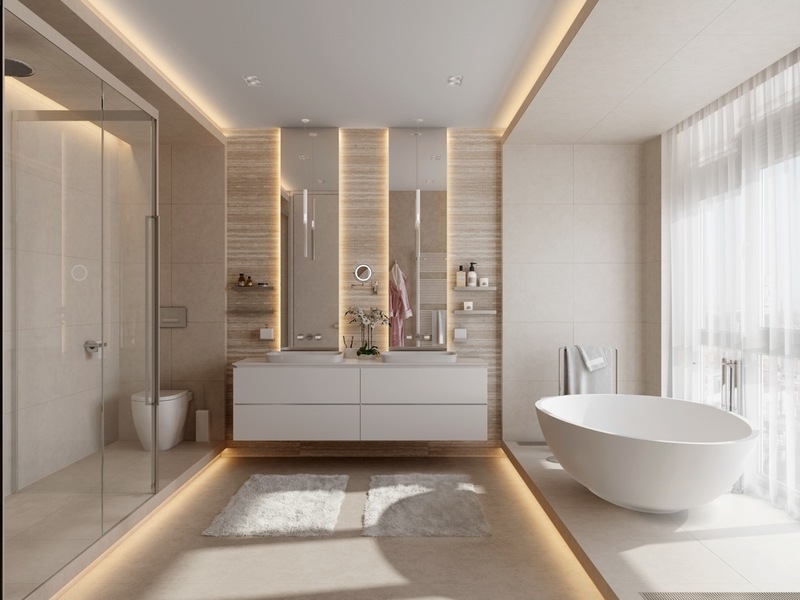 Install a light beneath the bath panel to give it a floating effect. This one runs around in a complete L-shape with the vanity unit. Got ducting? 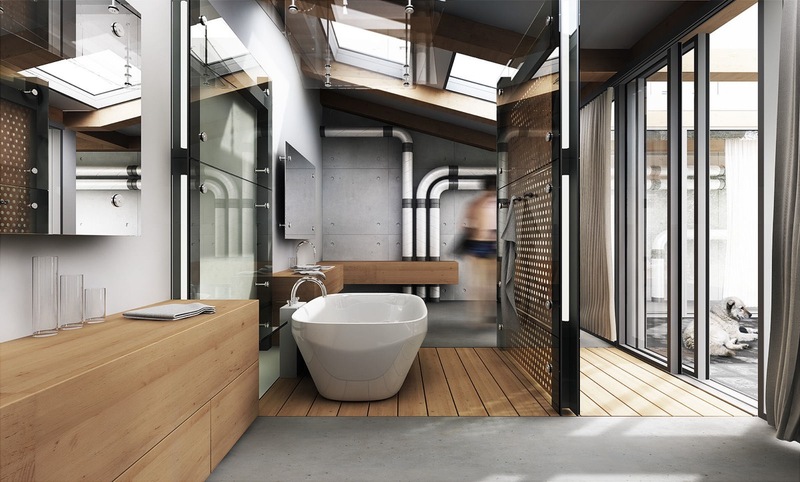 Then you’ve got yourself an industrial bathroom. Don’t try to conceal the workings behind a wall – make them your muse. Overlapping, interlocking elements create flow. Don’t like the look of flush plates? Camouflage it. 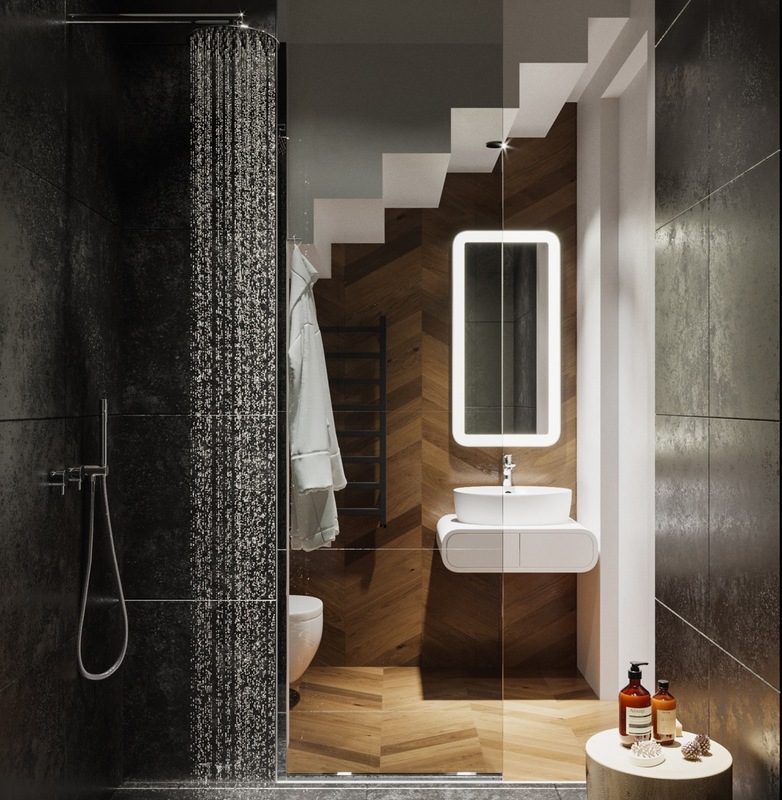 Even the smallest of spaces can look chic and elegant, like this understair shower room. Look at how the wood floor treatment continues up the vanity wall to unite the space. 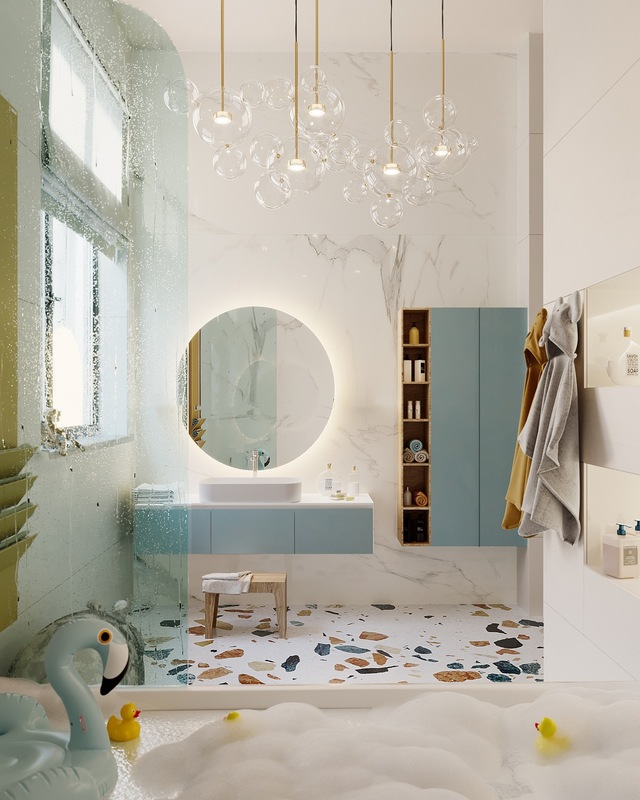 Another bathroom geared toward the youngsters in the home, though this time an elegant modern chandelier adds in some style to please the grown ups too. 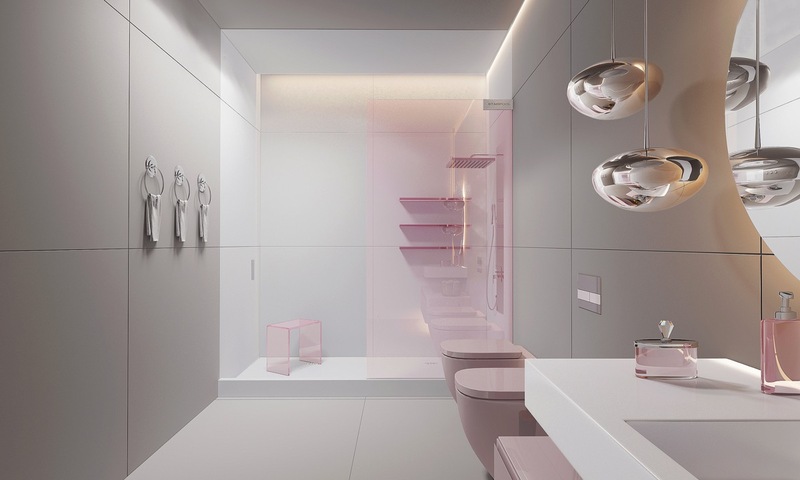 Seek out an extraordinary toilet. 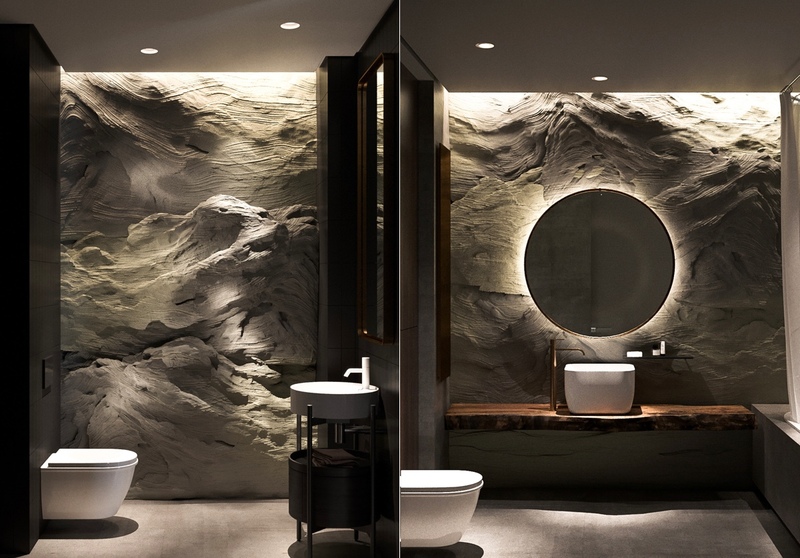 It takes a moment to register this smooth pebble shaped installation as a toilet at all. A swing arm lamp makes an interesting vanity light. 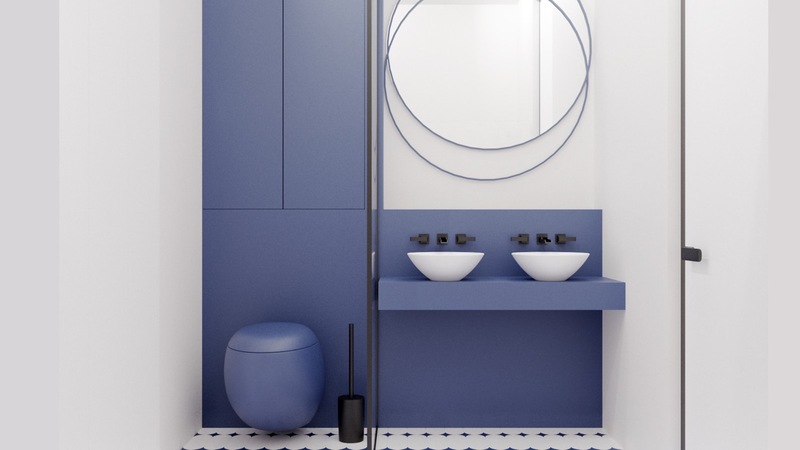 Colour block your cabinetry and sanitaryware. 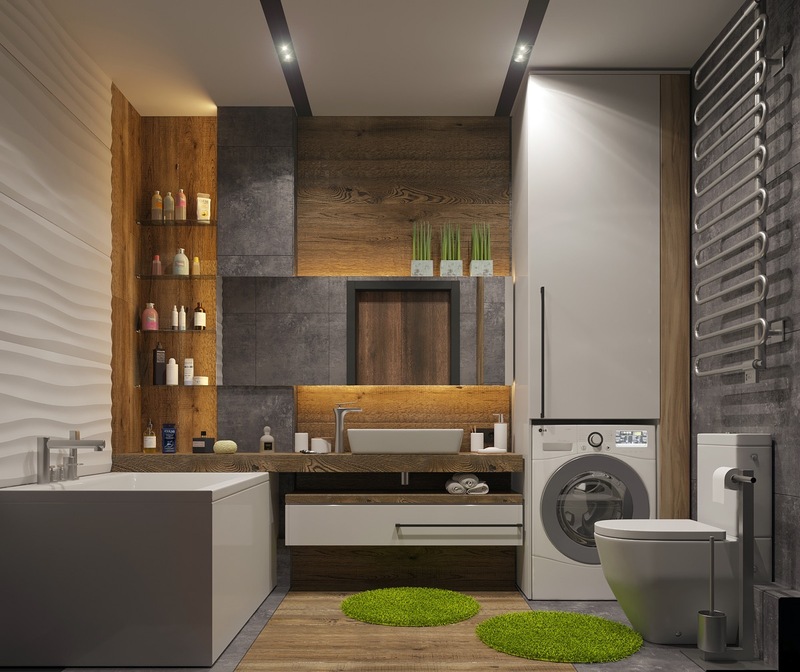 Keep the floor area looking spacious with a wall mounted vanity and towel storage combo. It will make the area easier to clean too. Add in some new lighting to update a bathroom shelving unit. 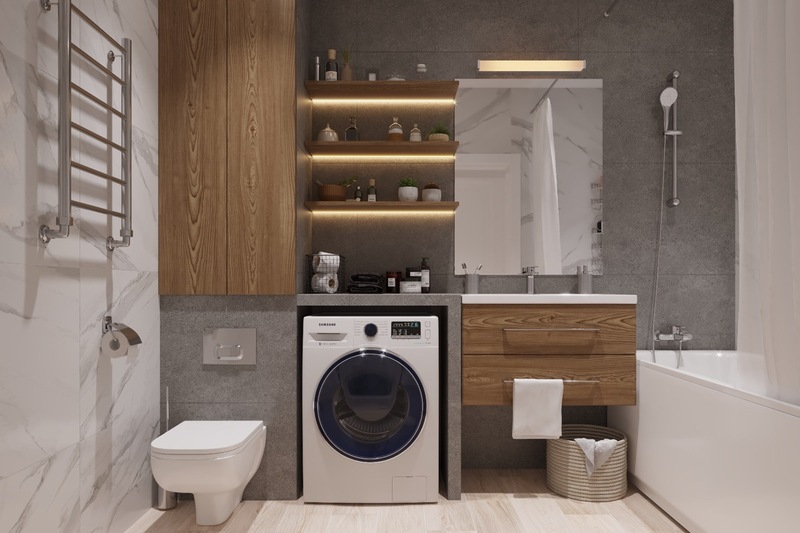 Also, dress and accessorise the shelves like you would in a main living space rather than cramming them with random toiletries – keep that for the concealed storage space. A custom cut shelf around a pedestal basin gives the piece an entirely new look. 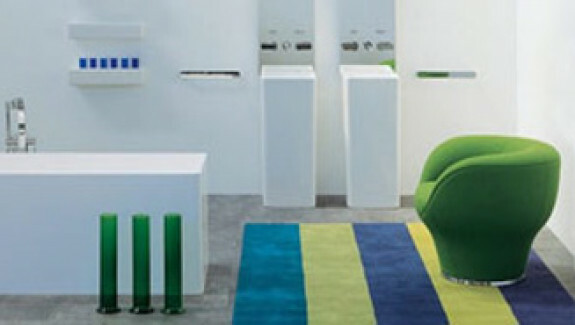 Bathroom mats provide a soft place to stand in bare feet. These ones look like little patches of grass growing right out of the floor. Employ double use furniture. A bench seat is a great place to pile clean towels as well as to sit. Love to while away the hours in a hammock? 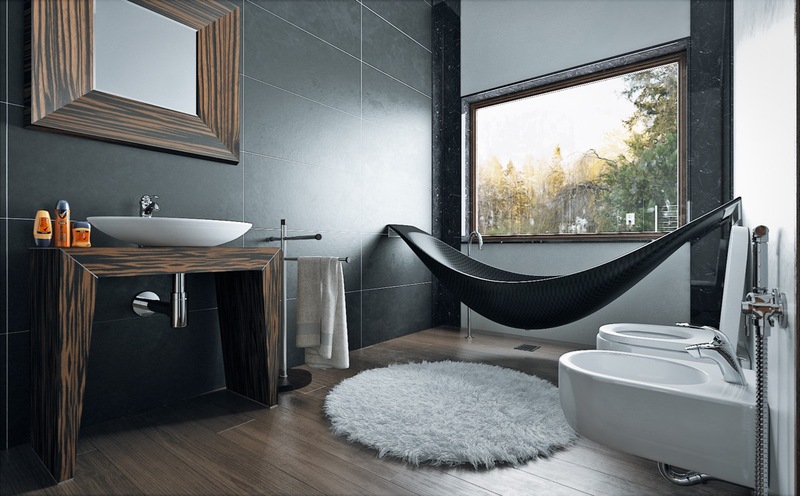 There’s a bath design for that too!